An international team of researchers have created a new structure that allows the tuning of topological properties in such a way as to turn on or off these unique behaviors. The structure could open up possibilities for new explorations into the properties of topological states of matter. 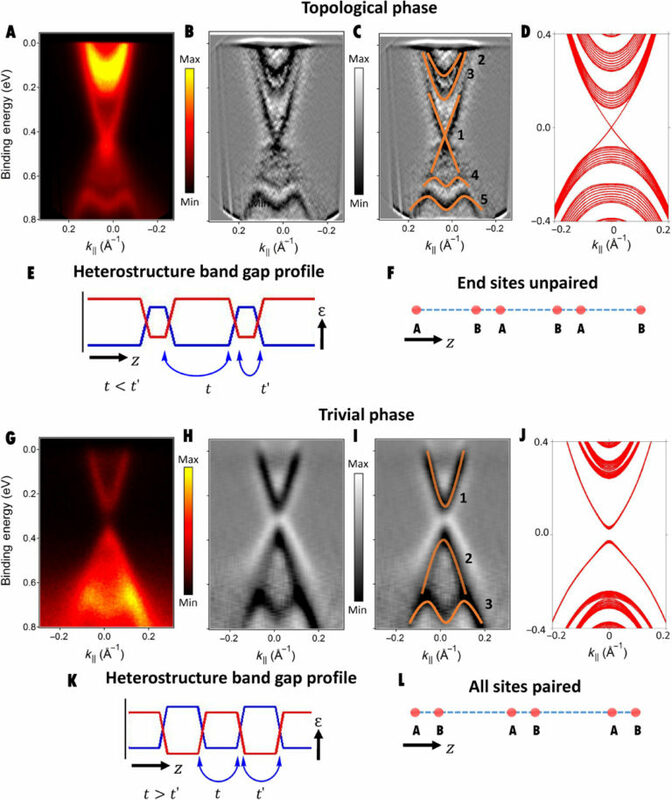 The new structure consists of alternating layers of topological and normal, or trivial, insulators, an architecture that allows the researchers to turn on or off the flow of current through the structure. The ability to control the current suggests possibilities for circuits based on topological behaviors, but perhaps more importantly presents a new artificial crystal lattice structure for studying quantum behaviors. Theories behind the topological properties of matter were the subject of the 2016 Nobel Prize in physics awarded to Princeton University’s F. Duncan Haldane and two other scientists. One class of matter is topological insulators, which are insulators on the inside but allow current to flow without resistance on the surfaces. In the new structure, interfaces between the layers create a one-dimensional lattice in which topological states can exist. The one-dimensional nature of the lattice can be thought of as if one were to cut into the material and remove a very thin slice, and then look at the thin edge of the slice. This one-dimensional lattice resembles a chain of artificial atoms. This behavior is emergent because it arises only when many layers are stacked together. By changing the composition of the layers, the researchers can control the hopping of electron-like particles, called Dirac fermions, through the material. For example, by making the trivial-insulator layer relatively thick – still only about four nanometers – the Dirac fermions cannot travel through it, making the entire structure effectively a trivial insulator. However, if the trivial-insulator layer is thin – about one nanometer – the Dirac fermions can tunnel from one topological layer to the next. To fashion the two materials, the Princeton team worked with researchers at Rutgers University led by Seongshik Oh, associate professor of physics, who in collaboration with Hasan and others showed in 2012 that adding indium to a topological insulator, bismuth selenide, caused it to become a trivial insulator. Prior to that, bismuth selenide (Bi2Se3) was theoretically and experimentally identified as a topological insulator by Hasan’s team, a finding which was published in the journal Nature in 2009. “We had shown that, depending on how much indium you add, the resulting material had this nice tunable property from trivial to topological insulator,” Oh said, referring to the work published in Physical Review Letters in 2012. Graduate students Ilya Belopolski of Princeton and Nikesh Koirala of Rutgers combined two state-of-the-art techniques with new instrumentation development and worked together on layering these two materials, bismuth selenide and indium bismuth selenide, to design the optimal structure. One of the challenges was getting the lattice structures of the two materials to match up so that the Dirac fermions can hop from one layer to the next. Belopolski and Suyang Xu worked with colleagues at Princeton University, Lawrence Berkeley National Laboratory and multiple institutions to use high resolution angle-resolved photoemission spectroscopy to optimize the behavior of the Dirac fermions based on a growth to measurement feedback loop. Although no topologically similar states exist naturally, the researchers note that analogous behavior can be found in a chain of polyacetylene, which is a known model of one-dimensional topological behavior as described by the 1979 Su-Schrieffer-Heeger’s theoretical model of an organic polymer. The ability to control the travel of light-like Dirac fermions could eventually lead future researchers to harness the resistance-less flow of current seen in topological materials. “These types of topologically tunable heterostructures are a step toward applications, making devices where topological effects can be utilized,” Hasan said. The Hasan group plans to further explore ways to tune the thickness and explore the topological states in connection to the quantum Hall effect, superconductivity, magnetism, and Majorana and Weyl fermion states of matter. In addition to work done at Princeton and Rutgers, the research featured contributions from the following institutions: South University of Science and Technology of China; Swiss Light Source, Paul Scherrer Institute; National University of Singapore; University of Central Florida; Universität Würzburg; Diamond Light Source, Didcot, U.K.; and Synchrotron SOLEIL, Saint-Aubin, France. Work at Princeton University and synchrotron-based ARPES measurements led by Princeton researchers were supported by the U.S. Department of Energy under Basic Energy AQ29 Sciences grant no. DE-FG-02-05ER46200 (to M.Z.H.). I.B. was supported by an NSF Graduate Research Fellowship. N.K., M.B., and S.O. were supported by the Emergent Phenomena in Quantum Systems Initiative of the Gordon and Betty Moore Foundation under grant no. GBMF4418 and by the NSF under grant no. NSF-EFMA-1542798. H.L. acknowledges support from the Singapore National Research Foundation under award no. NRF-NRFF2013-03. M.N. was supported by start-up funds from the University of Central Florida. The work acknowledges support of Diamond Light Source, Didcot, U.K., for time on beamline I05 under proposal SI11742-1. Some measurements were carried out at the ADRESS beamline (24) of the Swiss Light Source, Paul Scherrer Institute, Switzerland. This study was in part supported by grant AQ30 no. 11504159 of the National Natural Science Foundation of China (NSFC), grant no. 2016A030313650 of NSFC Guangdong, and project no. JCY20150630145302240 of the Shenzhen Science and Technology Innovations Committee.